This concert will be the first public appearance of the duo. Every three years or so, the collective known as Biota releases a new album of unclassifiable music. These releases, woefully missed or ignored by many, are events of singular importance in my basement office. While Biota has been in existence since the mid 80’s, the group originally was an offshoot of the Colorado-based audio / visual unit Mnemonists, which began in the late 70’s. So, not a new outfit, they have had ample time to develop their own distinct sound, though one that is difficult to grapple with or recount verbally. 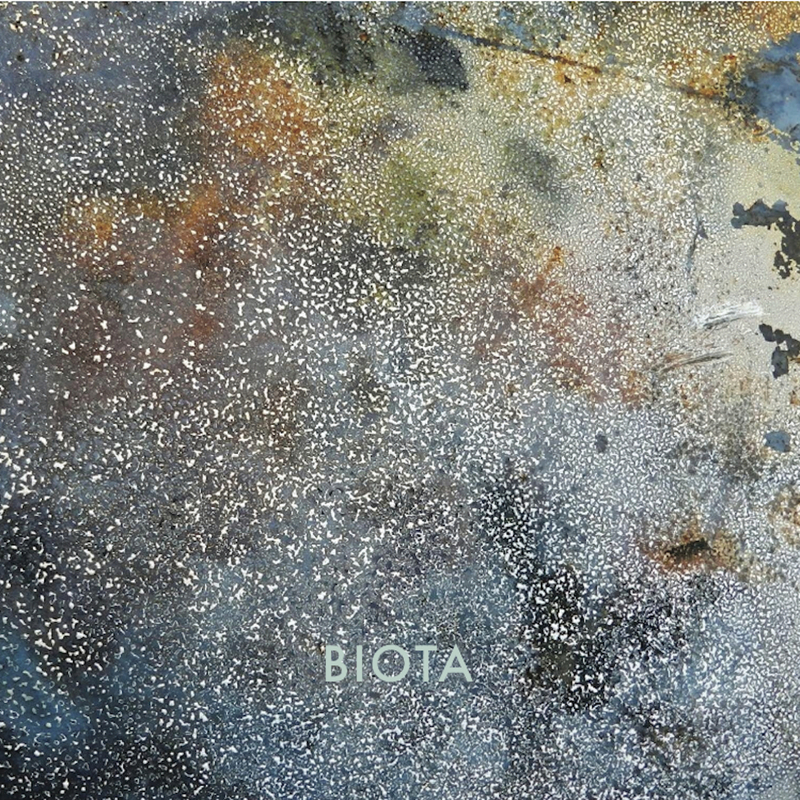 Weird Americana, dark folk, acoustic progressive rock, avant-garde electroacoustic…all of these labels help illustrate the generally-quiet, deliberate approach of Biota, yet none of them are particularly representative of the resulting music. The current lineup includes Mark Piersel, Tom Katsimpalis, Bill Sharp, Larry Wilson, Gordon Whitlow, Randy Miotke, Dave Zekman, Randy Yeates, James Gardner, Kristianne Gale, and Charles O’Meara (a.k.a. C.W. Vrtacek of Forever Einstein). Sharp appears to be Biota’s de facto leader, or at least a focal point. Funnel to a Thread consists of 21 tracks, each in the one to five minute range. But these individual pieces run together in a seamless fashion, producing an album-length suite. Instrumentally, the emphasis is on acoustic and electric guitar, piano, organ, violin, accordion, effects, and found objects, any of which may be electronically processed. Acoustic guitar is the most dominant of these, appearing on all tracks. Percussion is notably absent or downplayed, though tracks featuring a drum set, such as Winder and Choosehow, are some of the most compelling. Overtracked female vocals are featured on several tracks, and these pieces are high points as well. But there are no low points on Funnel to a Thread (or any other Biota recording). There is a beauty to this music. Dark, yearning, and primeval, yet employing technology to evoke an otherworldly feel. The recording and production are top notch as well, with a clarity that allows the many haunting layers of Biota to be appreciated. The word “unique” can be used here without hyperbole – no one else sounds like Biota. Though it may not be immediately apparent, the boundary-crashing mindset and bold open-minded attitude of the AACM and its multitude of undaunted voices — the Art Ensemble of Chicago, 8 Bold Souls, Fred Anderson, Air, Anthony Braxton, and dozens more — had a profound effect on the city’s underground rock scene. Bands and artists such as Tortoise, the Flying Luttenbachers, Cheer-Accident, Isotope, the DK3, Liquid Soul, Ken Vandermark, Powerhouse Sound, Yakuza, Minsk and Jeff Parker have been blurring rock, jazz and the avant-garde for decades. In recent years, Chance the Rapper’s the Social Experiment and avant-metal band Bloodiest sustain the AACM spirit, whether they know it or not.